Digitalization brings both new opportunities and confusion to even the most carefully planned selection processes for WCM. CIOs and IT leaders aiming to boost the effectiveness of their digital business strategy should use this document to help them select the most appropriate vendor and solution. Gartner Magic Quadrant reports are the standard of excellence for vendor evaluation, research and reporting. While many vendors are evaluated, only a select few meet the stringent criteria for inclusion. 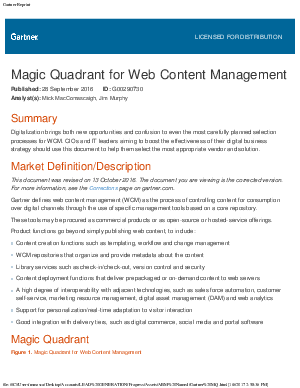 Continuing its long-standing tradition, Gartner has released the 2016 Magic Quadrant for Web Content Management (WCM). Progress is recognized as a “Challenger” in this year's report, based on a combination of completeness of vision and ability to execute. This is the third consecutive inclusion for the company's award-winning web content management and digital experience solutions. Web content management is an integral piece to any successful digital transformation strategy. In our minds the recognition by Gartner as a “Challenger” in this ultra-important customer-facing market is remarkable and would not be possible without the involvement and dedication to innovation put forth from our loyal customer and partner community.